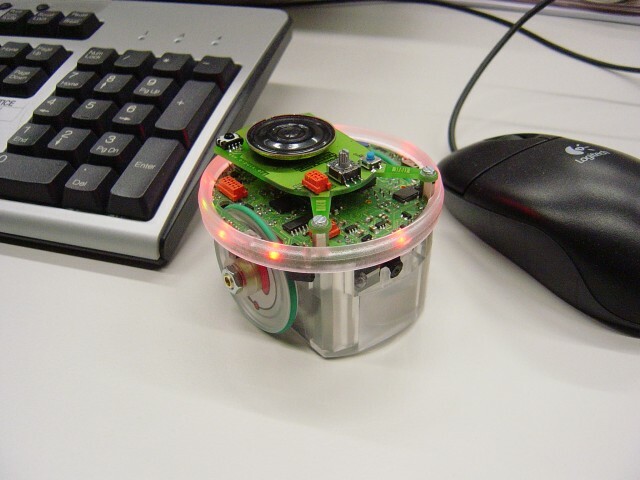 libIrcom is a library that can be used straightforward on the e-puck robots to achieve local range infrared communication, also known as range and bearing. libIrcom relies on the infrared sensors of the robots to transmit and receive information. However, the communication system is multiplexed with the proximity sensing system commonly used on the robots. It is therefore possible to both communicate and avoid obstacles. libIrcom allows communications at a rate of 30 bytes per seconds max from sender to receiver, including a 2bits CRC check in each byte to detect erroneous messages. Messages are encoded using a frequency modulation that permits usage in a wide range of light conditions. Messages can be detected at a distance of up to 25 cm between emitter and receiver. If continuous listening is activated, libIrcom will try to catch as many messages as possible, independently of the cycle duration of your controller. Messages are stored in a queue and can be retrieved at any time, unless they are overwritten when the queue is full. Here you can find the library and two examples. All material is made available under the GNU General Public License (GPL). How to test the examples ? With the libIrcom library 2 examples are provided : test and synchronize. Windows : Open project files located in synchronize or test folders. All necessary files are loaded, you can simply compile with mplab IDE then upload with the robots. We tested compilation with mplab 8.02. Test example : This example shows the comunication between two robots. One will be the emitter and the other the receiver. You will choose each one with the selector switch : 1-> Emiter 2-> Receiver. The emitter will start transmiting a sequence of numbers from 0 to 255 (1 byte) continuously. The receiver will take the frame and demodulate it. If the frame is well decoded the receiver will send it through bluetooth along with information about the location of the emitter of the message (orientation and distance). The orientation is expressed in the local mark of the receiver starting from the camera and going CCW. The distance is between the center of the 2 robots. Boths robots have to be connected to a computer through bluetooth and press enter to start the comunication between them. Once you are connected to both robots, press enter and check the transmision. i) Send information: Because of the number of robots, each robot will first send his own ID, and after that his own direction related to the robots from which it has receive a message. ii) Listen for some transmissions and decode the messages. If a message is an ID, it will store the direction where it cames from. If the message is an orientation addressed to it, it will change the orientation, according to this new information. Wrong messages received, or messages not received. Robots emit the same infrareds. So when several robots try to send in the same time, you are likely to receive only wrong messages. In addition, IR communications are slightly sensitive to light conditions. If you want to get close to 0 messages lost, try to work with controlled light, emitting few infrareds, and without oscillations. Timers. libIrcom is cpu consuming because it is monitoring very regularly the sensors. The interrupt used is set to a high priority which may superseed others. If you use agendas or any other interrupt, it is likely that some steps are lost. To cope with this problems of timing, we have implemented a time counter inside libIrcom (see ircomTools.c). libIrcom is the only tool that can give you accurate timings. Messages going through a robot or blocked by a wall. Infrared is light. Therefore a message can not be sent accross an opaque material. Given that e-pucks are transparent, it is possible that a message goes accross a robot. Do not expect that a robot is necessarily preventing messages to go through, make some tests, and restrict the communication range if needed. We are interested by your work and would be happy to know what kind of exciting things you achieved with this tool. Let us know !